Former Huskies star Markelle Fultz was said in documents obtained by FBI to have received a $10,000 loan from an agent. Big NCAA troubles loom for many. What if they gave an NCAA men’s basketball tournament, and only the University of Phoenix and Southeastern Western A&M showed up? That isn’t going to happen next month. But by the time federal prosecutors call to the witness stand John Calipari, Mike Krzyzewski, Tom Izzo, Roy Williams and other big-name coaches, the world outside college basketball may be ready to say that if baseball can call off a World Series, the NCAA can stop the party until the slime is hosed off the industry. A Yahoo! Sports report early Friday disclosed more consequences for college hoops in the NCAA’s century-long scam to preserve amateurism that enriches schools, coaches, athletics directors, TV networks and sponsors — everyone but the athletes — part of which has been under investigation by the FBI for almost two years. Besides identifying top-shelf hoops programs such as Duke, Kentucky, North Carolina and Michigan State as potential violators of the NCAA’s impermissible-benefits rules, Yahoo says the FBI documents included for the first time the University of Washington. 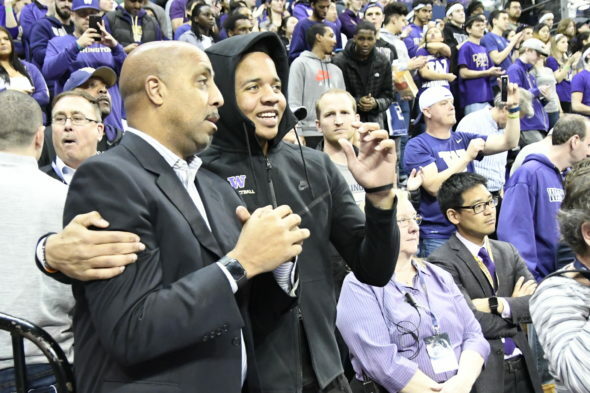 Documents disclosed that Markelle Fultz, who played a single season for the Huskies a year ago under coach Lorenzo Romar and became the NBA’s No. 1 draft pick, was allegedly paid $10,000 by ASM Sports, an agency run by former NBA agent Brad Miller, a primary target of the federal probe. Fultz did not sign with ASM. 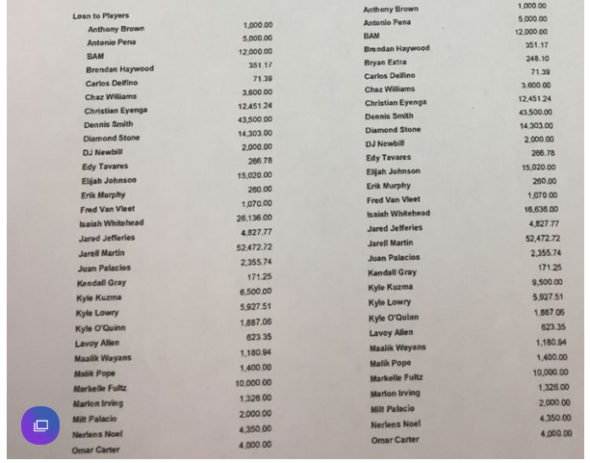 Also mentioned was another former Huskies player, Dejounte Murray, who allegedly received $500. No other evidence, such as a promissory note, transaction date or payback was provided in the story, so it’s not publicly known if Fultz took the money, and if he did, when he took it, and whether Romar or other UW employees were aware of the alleged transaction. No allegation of criminal misconduct by UW has been reported. “These allegations, if true, point to systematic failures that must be fixed and fixed now if we want college sports in America. Simply put, people who engage in this kind of behavior have no place in college sports. They are an affront to all those who play by the rules. When the first charges by the FBI were filed in September, four assistant coaches were arrested, including one at Arizona and one at USC, as well six others, including two executives from Adidas sportswear. Federal charges included bribery and wire fraud. A USC player, point guard De’Anthony Melton, withdrew from school because of the scandal. Emmert said in January that the commission will have a report by April with recommendations for changes as soon as the 2018-19 season. But if Emmert is serious about “systemic failures” in college basketball, the system is not going to get fixed in eight months by a committee — members of which are likely to have some interest in the preservation of the status quo — that lacks subpoena power to induce truth-telling. What the FBI’s subpoena power has discovered is a black market for talent procurement that barely can be called underground. For years, agents have been funneling money to players and/or families through shoe-company reps and others close to the premier NCAA programs. While coaches and their schools usually claim either innocence, ignorance or both about the rules-breaking, the NCAA is supposed to hold accountable the coaches via compliance programs at each school. But if the “loans” occurred before a player signs a letter of intent, the NCAA and the school in theory have no jurisdiction. The FBI arrests of the assistant coaches on criminal charges, not NCAA rules-breaking, can be a pivot point that changes that game, perhaps permanently, because those charged broke criminal law. If the allegations prove true and result in jail time — imagine what stories these charged coaches will tell prosecutors to keep themselves out of the hoosegow — the NCAA will be forced to confront its basic corruption. The NCAA has maintained a steadfast commitment to amateurism, despite the fact that amateurism exists at a high level in sports almost nowhere else in the capitalist world. The International Olympic Committee, which played an early 20th century role in creating amateur sports, gave up on the nonsense 3o years ago. As long as the NCAA continues to try to fence off its athletes from the rewards of the industry’s global reach and popularity, the college presidents and their supplicants will continue to be plagued by scandal, hypocrisy, black markets and corruption. As I wrote recently, the only solution that works is to completely professionalize football and men’s basketball, the revenue sports that sustain (or nearly so) every school’s non-revenue programs because of the immense TV rights fees produced. Any steps short of that by Emmert’s committee will be a band-aid, a kick of the can down the road. The banning of shoe-company reps and their runners, the tightening of compliance rules and the strengthening of sanctions will serve only to push the banned activities underground. They will be worked around as long as athletes remain deliberately impoverished by NCAA rules. One would think the NCAA executives and school presidents would be exhausted by swimming against the current. Perhaps the drowning of a few careers above the pay grade of an assistant coach will inspire a recognition of the only pragmatic direction. BIG MONEY . . . BIG PROBLEMS . . . PROFESSIONAL SPORTS ! The NCAA, Division I Universities, and fans must all be hit hard by the law in order to pull their collective heads out of the sand and acknowledge the STUDENT-ATHLETE is first and foremost the ATHLETE-student with college culture subordinate to the athletic culture. Then and only then will some strong sense of reason and reality be realized. Oh, yes, thank you, Art Thiel. You’re welcome. This comeuppance by an outside agency is long overdue. Not a UW problem but an NCAA problem. Might be interesting however to look at the players who went one-and-done like Fultz did since Romar had more that what even he expected. Coaches can’t always watch what players are doing all year around. Especially if players don’t want to be watched. But the NCAA demands the coaches be responsible for all. then again, the NCAA doesn’t look very hard. Remember the NCAA is nothing more than a trade association, with no real interest in policing a money-making machine. It is not the Taliban or ISIS. What it is, is either Laurel or Hardy. When I read Raw Recruits by Alexander Wolff and Armen Keteyian I wasn’t surprised that college basketball is mostly business but I was disappointed at how early athletes are sought after and just how many corporate entities are involved. And that was in the early 90’s when that book was published. Since then the evidence is fairly obvious that things go so much deeper since then but the NCAA simply looks the other way until they’re forced not to. (Much like MLB and steroids or the NFL and concussions, NHL and fighting, etc..) Just look at NBA drafts. Spencer Haywood had to sue his way into the NBA for early entry in 1971. Last year a senior wasn’t taken in the draft until the Spurs took Derrick White of Colorado at 29. Don’t tell me that doesn’t suggest agents involvement. I don’t think it’s realistic expect a coach and his staff to police so much. You know what else is unrealistic? Amateurism. Thought about this for a day and I don’t have an answer. Howard Cosell once said that Connie Hawkins book Foul is a book that “forever removes the concept that sports is a sacred cow and that the milk it emits is pure.” That’s how the NCAA views itself and IMO all it will do is levy fines and suspensions. At the very least they need to put together a full time committee that is unbiased to study, research and interview in its conclusions. Not former coaches or players or alums and not people who already have full time jobs. Were men’s football and basketball to professionalize it could be a Pandora’s Box to be dealt with. Athletes in other sports would feel trivialized and teaching staff would argue that it isn’t fair that an athlete who could become the next Chris Washburn gets treated so well when they have the next Jonas Salk or Ernest Hemingway sitting in their classroom. That’s why I think they’ll take the easy road and do fines and suspensions and a few terminations. Critics have been calling for college sports reform for more than a century. Nothing has worked. But this is the first time that felony arrests have been made, and jail time could follow. I’m most eager to see how it plays out. And the Sean Miller bomb just dropped. It would be the most Seattle thing ever if Romar leads Arizona to a title as an interim coach this year. The point of this article is that Romar/UW is implicated as well. Arizona will/can not make him the interim HC. Romar is not yet implicated because the public story — not the FBI evidence — doesn’t say whether Romar knew. Saturday’s disclosure on Miller says he authorized $100K in payments to Ayton. But Romar needs to have a damn good reason for NOT knowing. After 13 losses in a row got him fired, he vaults to the top of the college hoops world. The mind reels. Watch. Coach Romar will become the new Steve Fisher. One player is in trouble for $71.39. Coach K makes $7.3 million a year. That’s always been the ratio. Kids getting busted for PB&J sandwiches while coaches skate around the rules with a system the FBI is investigating. And just how will you align Title IX law with paying only football and men’s basketball players? The college pro league would be organized as separate entity, contracting with the school to provide services. Not subject to Title IX. And no taxpayer dollars are involved. The pro league covers all university costs plus enough to subsidize the non-rev sports. Gets sports off the backs of taxpayers. Thanks for the response. I think your plan has merit and is a good starting point. However, if this will in effect be a minor/development league, why even have it associated with the school? There’s significant risk attached to the brand of each participating institution based on the (mis)conduct of the team/league. There is more misconduct under the current set-up because it creates a value, amateurism, that doesn’t exist in the real world. The pretense is easily compromised. The association with the school is valued because of the connections that enhance fundraising among alums. Nothing like the drunken debauchery around a football game to have rich boosters wax sentimental over ol’ Siwash. All good points and thanks again responding. However, I don’t see the NCAA giving up control over its money-maker sports. If the NCAA runs the pro league, then that presents the potential for conflicts of interest between the NCAAs supposed concern for student-athletes and maximizing income for the league. Of course, that conflict likely already exists or the NCAA wouldn’t hesitate to house clean and award the death penalty to the programs that flagrantly violate the rules. The NCAA already has no control over its members; it is a trade association constructed to negotiate TV contracts, and make sure the baskets are 10 feet and the football field is 100 yards. The NCAA has had numerous opportunities to invoke the death penalty and passed on them. The FBI feels no such obligation to pass on criminal wrongdoing. Remember, the NCAA isn’t the Taliban. It is an organization of schools that have crafted its bylaws the way the university presidents and athletics directors want it. They can’t see beyond the annual budget to understand corruption is systemic. Steve Prefontaine fought this system as a runner at U of O..forced to tend bar at a Eugene Tavern to pay his bills while training and running for free. Pre found the Olympic games particularly egregious. Even the Olympics’ Avery Brundage understood the farce, and began allowing professional in the 1980s. How about independent development leagues? The WHL and other junior hockey franchises are almost always owned by businessmen and entities not connected to NHL franchises, and the one or two that are owned by an NHL team (Montreal has usually had one) are operated individually, and don’t connect player wise to the NHL team; its players can be drafted by teams other than Montreal. I have heard about Lavar Ball (I know, I know, just hear me out) has discussed founding a league for U-20 players who need another year after high school for the NBA age 19 rule, but aren’t interested in college. I could see that, creating another development option while leaving NCAA hoops more open to players actually interested in getting degrees or playing four years. The NBA already has a developmental league, but relatively few develop into NBA players. One big problem is that since the NBA doesn’t want to scout high school games anymore, they imposed a one-year rule in 2006 on colleges, from which the NBA takes only the 20 to 30 best from a class, the rest coming from Europe. But the NBA takes no responsibility for its role in killing its de facto farm system. I think our definitions of “developmental” leagues differ. I’m thinking of leagues where pro teams scout and then draft players from, like the WHL and NCAA. The developmental league you seem to be thinking of is like the Tacoma Rainiers and the old NFL Europe, for players who have already been drafted by pro teams but need seasoning before they hit the big clubs. What I want to see is an option for players who have finished high school but need another year before NBA draft eligibility, and don’t want to spend it in college. Unless those players are allowed to play for the NBA’s D-League, I can’t think of anywhere else besides a European or Asian pro team. I agree that the NBA’s one-and-done rule is a nuisance that leads to increased corruption, because top players are merely renting locker space at a college until March to maintain eligibility. But we’re talking about maybe 30-40 scholarship players annually who are worth bribing, from among the more than 300 schools at Division I. Since you mentioned Europe, I’ll take my argument for reform to another level by suggesting the European model for athletes who display exceptional athletic talent a young age: Academies. The private schools tailor academics around a training and development schedule that allows a balance, and a priority different than the competition with serious academic students at a D-1 university. Only handfuls of athletic scholarship recipients are sufficiently adept to handle the demands of academics and high-level sports. Bingo. That’s exactly what the Sounders and MLS have been starting the last few years. The Sounders academy produced Jordan Morris and DeAndre Yedlin, if I’m not mistaken. It would eliminate a lot of scholarships. Yet the free ride was for scholars in the first place. Higher learning was for kids to drink and be absent for class and make private corporations billions. You seem slightly disappointed with higher ed and its sincerity toward reform. So much for Romar’s squeaky clean image. The only difference between him and the others is that joining the cheating didn’t help him win. Do you have evidence he knew of the transaction? If so, please share. Of course I don’t have evidence, but I have common sense. These practices were widespread and widely known amongst coaches. He made a conscious decision to change his recruiting tactics in order to compete with the big boys. Even if he claims to be a “don’t ask, don’t tell” guy, it means he knew that there was something going on that he didn’t want to know about. Just like Pete Carroll. Yes, the coaches cannot keep their eye on all of their players 24-7, but these tactics were so commonplace that to claim ignorance is not forthcoming, at best. It doesn’t make them bad guys. But it does remove their ability to carry their squarely clean image. The transaction allegedly happened before he enrolled at Washington. The questions are what did Romar know and when did he know it? I don’t think he’s any more innocent than the next coach desperate to win at D-I, But some of these guys were kept deliberately in the dark by subordinates who conspired to give the top guy cover. Think Don James from 88 to 92. By the presence of the NCAA in your community. Tryin’ out Wiggins like Cigarette Feends! Headin’ for the dance at the Arm’ry! With the arms of a jungle animal instink! Friends, the student-athlete is the NCAA-Devils playground! So DB stands for Robert Preston? Well done, Prof. Hill! I once did a similar parody in a public forum regarding the Rick Neuheisel saga, complete with a top chous. Fortunately, no recordings exist. Ah yes! Slick Rick! I’m truly sorry I missed your rendition. Of course you know this, but baseball didn’t ‘call off’ a World Series. The MLBPA went on strike. Big difference. Players struck and Selig called off the series. He could have played it with scabs, as he started to for the 1995 regular season. The fans don’t care. March Madness will go on without a hitch this year and every year. The final “one shining moment” will be played in slow motion, and cheerleaders will cry. A coach or two may fall, Mark Emmert (the pride of Fife) will pontificate, the FBI may get some guilty pleas and then we’ll look forward to Hopkins’ second season. There have been college basketball scandals since…well, college basketball. Seattle U had a couple. There have been players playing under different names, point shaving, money passed around and games tanked. The fans don’t care. Generally, you’re right. For 150 years in colonial America, many people didn’t care about slavery either. Sorry, Spike Lee, it’s not about the shoes. It’s about wire fraud, bribery and lying. Felonies. Those are legal in the good ole USA. It depends who you are and s peaking too. Fake news. What about the fruit baskets?!? Don’t forget the leather jacket. It’s time the NFL and NBA pay for their minor leagues. The taxpayers have been played for saps long enough. UW should vacate the NCAA tourney victories from last season. Oh, gee, we did not have any.